OK, maybe sometimes I do. Maybe just this once. I've already written about how powerful Sarah Palin is. And I've said how much I love politics. Today's events appear to be pure political genius, perfectly executed. My friend Molly was here this morning, helping me dig out of the mess created in my house. We cranked up the TV so we could hear over our cleaning and chatting. My children were very interested in watching the events unfold. In all honesty, I was positively giddy all day long. I've heard it said a million times over the last nine months. Every-feminist-body and her sister has held Hillary Clinton up as the ideal role model for our daughters. See? She proves that women can do anything. Be anything. I don't think so.Hillary doesn't inspire me one bit. Sarah Palin began her speech today by honoring the man who is her husband and introducing those five precious blessings.She began with those closest to her heart and then unpeeled the rest of the layers of who she is for us to begin to get to know. She's a complex, full woman, who is clearly confident in her varied roles. She's a nursing mom in her forties who wears her baby to public speaking engagements. Her family looks very much like the big families I know. It was obvious just in the short time we saw them how they are all interconnected to meet each others' needs. My daughters recognized themselves in the teenaged daughter cradling the baby. And though I have no aspirations to ever be in politics, I could identify with this woman and her abundant life. It was my sixteen-year-old son who pointed out just how much I could take from Sarah Palin's example. I was sitting in the kitchen watching Molly scrub the stove and bemoaning the fact that I can get so little done lately. I attributed my sluggishness to "advanced maternal age" (that despised term of obstetricians) and the busy-ness of life with a gaggle of children who span the ages. "You know," said Christian from the other room, seemingly oblivious to the conversation in progress, "I think the question of her experience can be answered really easily. 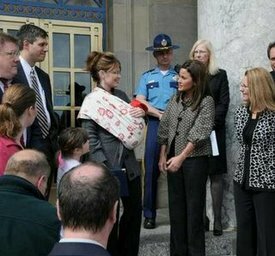 Just make a list of everything Sarah Palin has done during her short term as governor. Compare that to Barack Obama's accomplishments during his short time in the Senate. She looks great." And then he looked pointedly at me. "Oh, and she was pregnant for nine months of that time. She's 44."